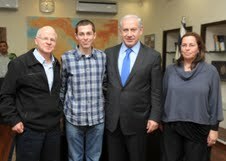 Gilad Shalit met with Prime Minister Benjamin Netanyahu on Thursday in the first encounter between the two since the day Shalit was released after more than five years of captivity as a hostage in Gaza. Meeting in Tel Aviv with the prime minister and David Midan—a former intelligence official who represented the government in the prisoner exchange negotiations—Shalit and his parents thanked them both for their efforts in securing his release. “I’m very happy to meet you,” said Shalit, who looked markedly healthier than on his release five months ago, smiled frequently, but also seemed a little awkward. “In the end, you were able to get me out,” he said to Netanyahu. Meanwhile, Channel 2 News reported that the IDF is setting up a “special team” to better grapple with situations such as the Shalit kidnapping, based on information Shalit has provided during his ongoing debriefings about his time in captivity. Shalit was “sharp-eyed” and “astute,” and has been able to provide more information than had been expected, the report said. Shalit’s family gave Netanyahu a coffee table book about the Hula Valley, a popular resting place for migratory birds. In a handwritten note to the prime minister, Shalit compared his feelings of freedom to those of birds in their natural habitat. Netanyahu said that this year, Passover, the holiday of liberty, held a special significance for Gilad. “The holiday celebrates our exodus from Egypt and you experienced an actual exodus from Gaza,” said Netanyahu. The prime minister congratulated Shalit on the visible restoration of his health; Shalit responded that with the passage of time he was becoming more active and had gained 6 kilograms (13.2 lbs) since his release. He also said he looking forward to being honorably discharged from the IDF soon. Netanyahu said that the window of opportunity to close the deal on Shalit’s release had been very brief and that it was uncertain whether the deal would have gone through under the emerging regime in Egypt. The Almagor Terror Victims Association strongly condemned the publicity surrounding the meeting as inappropriate, offensive to terror victims’ families, and encouraging to further kidnap attempts. In a statement, the organization said that every celebration of Shalit’s release would raise the price of releasing the next hostage. Since being released in October last year, Shalit has met with French President Nicolas Sarkozy and Israel’s only player in the National Basketball Association, Omri Casspi.